Before 2018 ended, I looked back to my fitness journey. I maintained my ideal weight, I felt stronger, and I developed my body. Overall, I felt good about my physique and it boosted confidence. While I know that I am still far from my goal physically, I celebrated the progress that I had. After all, it has been a year of daily workout in Pound for Pound Makati. And so, for this year, I promised myself that I will continue my fitness journey. I kicked it off with Sun Life Resolution Run. This is the second time I participated in the run. At the same time last year, I conquered a 5-km run! Admittedly, I am not a runner so it was an achievement for me. This year, I kept the distance but improved my time. 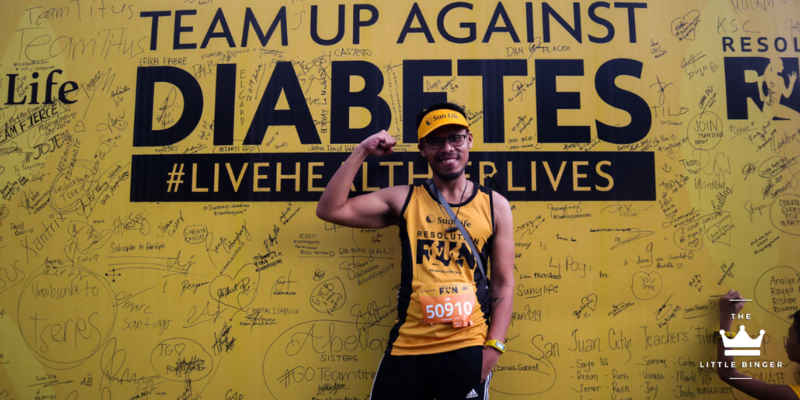 I want to share with you my Sun Life Resolution Run 2019 Experience! SunPiology is now on it’s 10th Year! Sun Life’s advocacy to promote health and wellness among Filipinos happens through SunPiology. Now on its 10 years, the physical activities have been more challenging and fun! Among the series of activities in the line-up were cycling, swimming, and running. This year’s leg of Sun Life Resolution Run remains at its original home in Camp Aguinaldo. The afternoon run on January 26 accommodated three sets of distance – 500m, 5k, and 10k! The 500m sprint race happened first while the 5k and 10k runs happened consecutively at around 5PM. Hundreds of runners- newbies and experienced- joined Sun Life Resolution Run! I arrived just in time for the race so I took the opportunity to take some shots for Instagram and the blog. Don’t judge me, Bingers. I gotta do what I gotta do. I was supposed to run with my friends and fellow bloggers but I was not able to find them in the sea of people. And so as soon as the gun fired, I started my Spotify playlist and ran! I am a regular gym-goer and a circuit enthusiast but running tested my physicality. In a fun way, I must add. A few kilometers in and I already started feeling my legs but as I learned from working out regularly- NO PAIN, NO GAIN. This is why I pushed through! Good thing is it was cool that afternoon and the shade from the tree made running more tolerable. A little over an hour later and I reached the finish line. That is a feat for me because as I keep on saying, I am not a runner. Apparently, that is what GoWell and Sun Life wants to promote in this event- celebrating physicality. Running, similar to any physical activity, is not about the end but rather about the journey. Did I had a challenging time during the course? Yes! But did I feel a sense of accomplishment after crossing the finish line? Definitely! May this inspire you, Bingers, to start a healthier lifestyle this 2019! We are only on the second month of the year and we can still accomplish so much more! If you have some fitness question, don’t hesitate to drop them in the comments or reach us on our social media channels below! Let’s run for a healthier 2019, Bingers!